Aaron Hughes eyeballed world superstars Gareth Bale, Mario Götze and Yevhen Konoplyanka at Euro 2016. Joining Hearts won’t faze him at all according to his international manager, Michael O’Neill. The defender’s birth certificate may state he is 37 years old but O’Neill advised Hearts fans to look beyond the age of a player he insists is in physically impeccable condition. Hughes signed a six-month contract with the Edinburgh club yesterday, as did the German left-back Lennard Sowah. Both are intended to reinforce a defence which has conceded 26 goals in 21 league games to date this season. Hughes was a key part of the Northern Ireland squad which reached the knockout phase of last summer’s European Championship. He faced some of the tournament’s biggest names from clubs like Real Madrid, Bayern Munich and Sevilla. Whatever the Scottish Premiership throws at him, O’Neill is convinced he will handle it. “He’s not a 37-year-old in terms of where he is physically. He’s looked after himself impeccably throughout his career so I don’t think his age is a factor at all. Hearts fans will see that quite quickly when he starts playing,” O’Neill told the Evening News. “Athletically, he’s held his own with Northern Ireland against some of the best players in Europe. We played him at right-back in the finals and he came up against Konoplyanka, Mario Götze and Gareth Bale. He’s used to playing against that calibre of player. Hughes made his name in England’s Premier League with Newcastle United, Aston Villa and Fulham. After spells in Australia and India, he arrived in the Capital last week as a free agent. He consulted O’Neill – who still lives in Edinburgh – about the possibility of joining Hearts, whose assistant coach Austin MacPhee is also part of O’Neill’s Northern Ireland coaching staff. “He came up to Edinburgh with his wife and had a look around once he thought this move was going to happen. We had a coffee and a chat,” continued O’Neill. “If I’m honest, I’ve spoken to a lot of Scottish managers about Aaron in the last 12 months. A lot of them showed an interest in him. 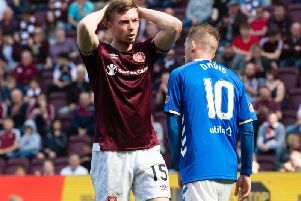 “I know Hearts have got some young players in their back four and Aaron will help them, but he’s still very much capable of playing at the top level. If you look his number of appearances in the English Premier League, it’s up there in the top ten or 15. He’s played international football consistently since he was 18 or 19 and now has 104 caps. “He brings a wealth of experience but he’s also such a top professional. Just having him at the club will be a bonus. Young players can only learn from him in terms of what it means to be a professional and how to prepare for games. Scotland is now the latest port of call in a career which has touched the heights. From his talks with Hughes, O’Neill revealed the defender’s thought process. “In the last 18 months, Aaron has wanted to see different things. He went to Australia and India when he could’ve stayed in England. I think that’s partly why he’s attracted to Hearts. He’s never played in Scotland and he’s interested in coming to Edinburgh.